Your guide will provide field transportation in one of our specially designed one ton 4-wheel-drive 4-door crew cab trucks, which are also equipped with secure dog boxes, game storage, water cooler and first aid kit. 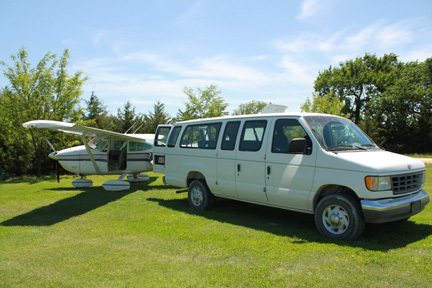 Ringneck Ranch has a 15 passenger van which is available by prior arrangement for an airport pick-up. Beloit, Kansas (K61) – 30 minute scenic drive to the ranch. Salina, Kansas (SLN) – 1 hour & 20 minute drive to the ranch. Kansas City, Missouri (MCI) – No airport pick-up. Best alternative is a rental car. Stop at Cabela’s on the way next to the Kansas Speedway. Please remember that pheasant hunting can be very physically demanding. Know your limitations! 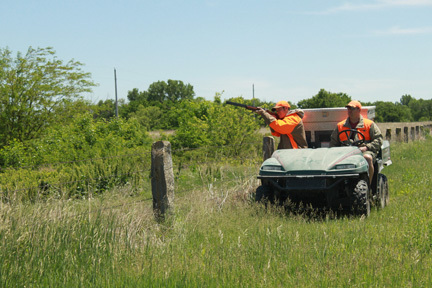 With prior arrangement and with the proper no fee permit for non-residents from Kansas Wildlife & Parks, a 6 wheel Polaris Ranger ATV vehicle is available for use for individuals that may not be able to walk, but would like to actively participate in the hunt. Kansas residents with a “Disabled” vehicle tag do not need a permit. Detailed information is on our licensing page. Please contact the ranch so that we can assist you with those arrangements.